The rare harlequin gecko (Hoplodactylus rakiurae) stands out against this background, but is well camouflaged in its usual habitat of herbfields, shrublands and granite outcrops. It grows up to 8 centimetres long from its snout to the base of its tail. This species was discovered in 1969 and scientifically described in 1981. 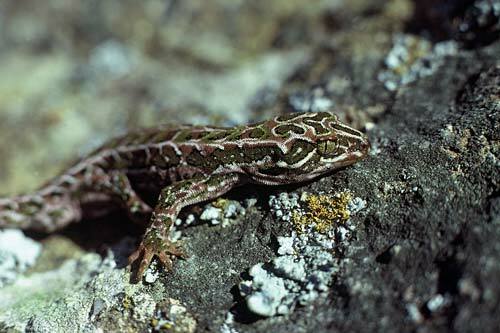 Found only in the south of Stewart Island, it is probably the most southern member of the gecko family worldwide. At 47° south of the equator, with low sunshine hours and frequent rainfall, Stewart Island is a challenging environment for cold-blooded reptiles.